This is what you must know, deep within your heart: The Universe conspires to bring you your very best life. Your job is to ask for help, listen to the answer and then act (or not) as the case may be. Our tendency is to try to plan, control, direct and influence the flow of life, with at best frustrating results and at worst disaster. Here’s the thing: we just don’t have enough information to run the show. It is much like asking a wave to coordinate the ocean. Imagine, just for a moment, the complex intricacies of even the simplest task. Just getting to work in the morning depends upon countless interactions that have nothing to do with you and which you have no control over whatsoever. If today, the kids are sick, the bus is late, the traffic is banked up or your car won’t start, try not freaking out. Don’t go there. Imagine for one moment, that whatever is happening is perfect. Yes, perfect in ways that you have yet to understand. Try, for just this moment, saying to yourself, ‘yes, this is happening to me right now. What if this is actually perfect?’ And then just go with it. Whatever is happening, just go with it. Alarm clock didn’t go off in time. Took the various means to get to work but before. He got there, he developed a blister on his foot. Love you guys! Have a beautiful day <3. what if this is perfect? Previous Learning how to relax and other stories. Next Time Management and other delightfully interesting stories. As I’ve been alluding to in my weekend edition posts, there’s been some upheaval in my world – the kind of stuff that makes you feel like the Universe is conspiring against you, UNTIL the energy shifts and the pieces click into place and you suddenly realize that the Universe knew EXACTLY what it was doing, and it was trying to help you out all along! Now, I know that sometimes we never get to see the WHY behind what happens, but I do believe that everything happens for a reason, even if we can’t figure out what it is. I try my best (though, sometimes it’s hard) to accept what’s happening even as I advocate for myself and my daughter and make sure I’m proactively pursuing what I want. I don’t know that I’ve ever let go of the steering wheel, but I do try to drive a little like I’m riding the vibes on a Ouija board … following the tugs and pulls that draw me to turn a little to the right here and a little to the left there. Jamie ❤️ I’m so glad to see you here. I was just about to P M you because I was getting worried! I didn’t see a post from you the last couple of weeks (or did I just miss them? I hope not). I’m so glad this was useful to you. I know exactly what you mean. When I get glimpses of just how beautifully put together the whole thing is, I wonder why I even bother, seriously. And then, I forget again and go back to my backseat driving :). That feeling of slow comprehension as the pieces fall into place, that it wasn’t a conspiracy or punishment after all…priceless. Your metaphor is just perfect – backseat driver on a the toy steering wheel, trying to steer one way when the Universe is really trying to get us to go in the opposite direction. Love it. This all serves to remind me how important it is to be open and accepting, to stop with the constant snap judgments and preconceived notions. 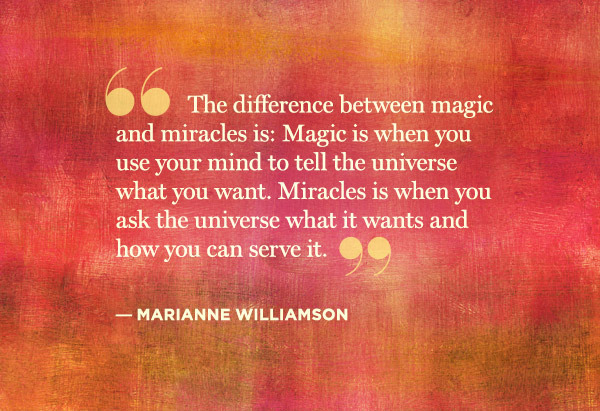 I often experience synchronicity, and each time I do I realize that the answer or solution or “miracle” was right there all along – just waiting patiently for me to come to my senses and recognize it for what it was. I’m thinking meditation will help me improve my “listening” skills so that I can pick up on these things sooner rather than later. Well see! Yes, you have been in my thoughts for weeks, and yesterday while I was at work you flashed in again. I thought to myself, right, I’m messaging Jamie when I get home, and then there was a message from you! And…me too! I need to create more silence so I can listen! Ah, thank you Ardys. I’m so please it resonated with you. I think most of us take a while on this one. Even when we know it, we forget it, then relearn it again. And again :). I’m sure it’s not just me! I think there is a waiting list for the slow learners class… even though many of us have graduated. I have stories from both sides: where I did listen and delay served me well… with near misses that prickled the hairs on the back of my neck; and where I pushed things along and spent years living with then cleaning up the mess. I think for me it got better with age when I told my ego to rack off, stopped worrying about what other people thought and began to value my own counsel (and that of my higher self, guides, muses, etc). As Suddenly Jamie commented…synchronicity at work… your thoughts tie in with a piece I’m cobbling together. Interesting. Hi Lillian ❤️ if only there was another way we could understand our lives rather than after the event! I haven’t found it yet, but let me know if you do :). It’s got to be catchy, because our first instinct is to not be okay with anything that goes against what our mind has created. At least this way I can grab it before my ego goes into a full blown tantrum, and say All delay is divine like a mantra 🙂 it calms me down! Sara, I have to give your post some serious thought because it is so contrary to my normal view of things.I understand that when things don’t go as you wish, you have to accept that. You really have no choice, and you don’t want to waste energy lamenting that things didn’t work out. However, some events in your life are just so awful, so tragic, that it is extremely hard to accept them. But I suppose those are the things that you have to accept most. Practically speaking, delay can be valuable. I remember working on a book and having unbelievable problems writing one chapter. I worked at it and worked at it and worked at it, and it just did not take shape. But eventually it came to me, and the chapter turned out to be the best chapter in the book. So when I’m having trouble writing, I always think of that experience and try to accept the delay, expecting that it will lead to something fruitful. Your post reminds me of the title of a story by Tolstoy: “God Knows the Truth, but Waits.” So maybe in life, whether it be God or some other power, possibly something knows the truth, and we have to wait for it. David, I know that men in particular find this way of thinking very challenging. My partner gets irritated just thinking about not being the one in full control :). For me, it’s about finding the right timing. Just like your story about your chapter, some things just have to wait. Sometimes there is a bigger narrative going on than the story we are telling ourselves. And also, most difficult to accept, sometimes the right action is to do nothing. Some things are extremely difficult to accept, I know that. But whether we accept them or not is completely irrelevant to the event itself. It’s already happened. Sometimes we may feel sorry for ourselves and say ‘why me?’ or ‘it’s not fair, this should never have happened.’ Resistance to reality can take on a slightly more subtle form and look like blame shifting, anxiety or guilt. And at the end of the day, none of those things change what has happened. This thing has happened – now what? It’s a very practical way of operating I think. Hey David, it’s rainy here, and 15 C. It’s been like that all week. What’s the weather like where you are? Sara, the weather hereabouts these summer days, unlike yours recently, is lovely. Mid 80s (F), clear skies, sunny. Here’s what you do here on such days. Yesterday my wife (you know Diana) went swimming while I wrote; then we went to an Italian restaurant buffet lunch; then to walk in the fantastic Chicago Botanic garden to look at swans, and then up north for hot fudge sundaes at a little wrought iron table while children played all around. The weather here in Chicago is volatile. The coldest wind chill had here is -82 degrees F, and the highest heat index temperature is 119 degrees F, so the range is more than 200 degrees. So we really appreciate these perfect summer days. Plus, I thought Australia was the land of climate extremes. Apparently not! Yes! This! These days, when I’m delayed in traffic, I think about the fact that it could be keeping me out of a wreck. And I’ve had times when I’ve been pushing and pushing to get something done, only to be butting my head against a wall. Then I remember to just let go and let the universe do it’s thing. Usually works like a charm. Gosh, it’s such a more relaxing way to live one’s life :). Things just seem to go so much easier when we feel how the flow is going rather than using our will to push things through! Such a profound post Sara, these thoughts go much deeper than we generally think so, unfortunately we don’t stop to reflect, we have gone into a pattern of learning and living life. Yes, we loose the idea of living the moment we confine it to few things and try to plan everything, keep controlling and keep directing things the way we want it to be, and many times things just doesn’t happen the way we plan and expect, what do we do, do we accept and go along or do we resist and revolt till we get what we want and the way we want it. It is indeed very difficult to draw the line and follow a path. In life we realize that things happens and it happens for our good, and we have no way to prejudge and question the way things happen in our life, in fact we don’t have any control and we trained ourselves or we may be told that we have things in control but there is something called destiny and there is something called divinity that decides and determines how life proceeds and why certain things happen the way it happened, only in hindsight we have reasons and justice. The question we keeping pondering, why it has happened to me and why I am the victim but this question is what each one of us ask, so where is the impartiality or injustice of life happens to us only. The question of whether we keep pursuing something through hell and high water, pushing through obstacle after obstacle to get what we want when it may or may not be Divine will is a tricky one. How do we know if we are being tested, or if it really is the wrong thing for us to be doing? I think in practice it feels different is the short answer to that one. I think about how different it feels to be engaged in a large but difficult project like a university degree (or writing a book) with all of its struggles and obstacles…but I am sustained in my heart by the knowledge that I am on the right path and I feel somehow supported in this choice. I think back to another time where I decided I wanted to live somewhere else, and the obstacles that the Universe threw up for me then, and it feels completely different. Very well pointed out Sara, where to draw the line that we are being tested or we are on the wrong path, if we don’t differentiate we shall hit hard at the wall to no avail, it is not easy to spot the difference. Perhaps this comes with matured and learning what we call as the “art of living”, many have mastered this art of living and what they do they do it correctly or what comes their way prouduces result not the case with others, and it has happened many times we do the same way but we are not blessed with the desired result and we keep searching for the answer where as others have the joy in their basket. Maybe there is no right or wrong answer it is the context and destiny that determines everything but we cannot close our eyes and do nothing, we have do what we have experienced and what we want to experience with a proper balance of emotion, logic and some degree of intuition. It is indeed a lovely perspective to keep dwelling on and thanks so much Sara. Yes, do try it Andrea. The answers may surprise you! Oh my – I came here via Jamie’s Live to Write, Write to Live blog. Your words set off a light-bulb in my head about something that happened today! Such a perfect message, Sara. Simple but so effective Tahira. Lovely to see you here iron woman ❤️. Cultivating awareness around these wonderful concepts has been central to a more peaceful, gentle way in being in life. I don’t find it easy! but the inner truth of it speaks strongly from my soul, and life is better when I listen! Another tangent prompted also from the 911 quote…For me the role of the divine (or nature/cosmos/earth mother/immensity of life/death/life cycles) also speaks reassuringly to the death aspect of the life/death/life cycle: those who weren’t delayed and did die. It speaks of heart acceptance and seeking peace in the not knowing and that it ‘just is’. Its the way of this world, a life cycle above and beyond (yet part of which we are powerfully importantly linked) without any capacity for control. From this I can live peacefully enough, embraced and trusting in earths cycles. Heart acceorance qbd Peace feels so good, eh. Even when it’s a glimpse in amongst other stuff – coz it reminds you it is always there!